While it may seem like trivial argument, the debate over the manner in which maps portray different regions is actually pivotal and multi-faceted. If you clicked on this article to find a short answer to whether maps are racist, then here it is: yes and no. As many of us know, there are several different map projections that have been created. Each projection is unique and has its own benefits as well as downsides. A two-dimensional map will never be 100% accurate because the world is a sphere and it is nearly impossible to put that sphere on a flat surface in a way that keeps all dimensions precisely correct. Typically, schools in the U.S. use cylindrical map projections to teach geography to American students. 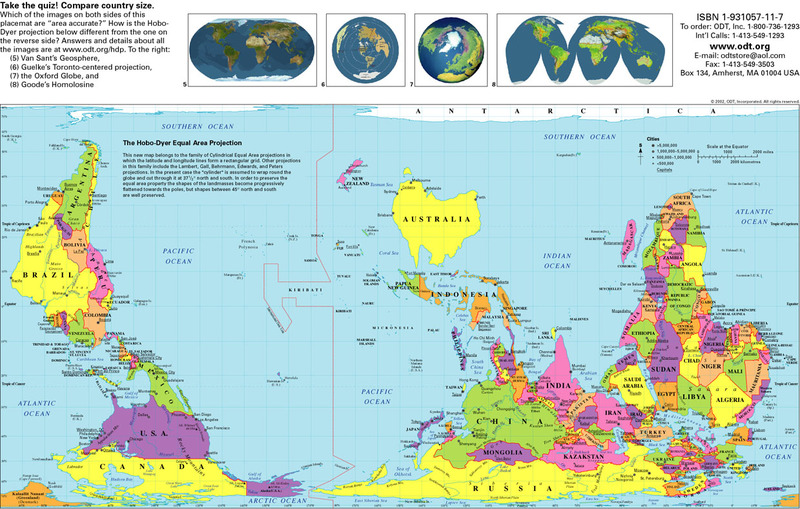 These projections give the most clear depiction of Earth’s land masses and have straight coordinate lines crossing horizontal parallels at right angles. The scale between each consecutive line is consistent. The Mercator map is the most popular of the cylindrical map projections and is widely used in classrooms so that students may visualize the world as a whole. However, this projection offers a highly-distorted view of Earth’s regions in comparison with each other. Because the Earth is a sphere and the map is a flat rectangle, adjustments must be made. Regions near the North and South poles are stretched and made to look bigger than they actually are. The regions near the equator are the most accurate portions of the map. By now, many of you may be thinking, “Yeah, yeah, obviously some things will have to change when a map is made, but why are people fighting over it?” Allow me to explain the reasoning behind the debate. Using the map as a reference, Greenland looks to be about the same size as Africa; however, in reality, Greenland is 836,300 square miles while Africa is 11.73 million square miles. Simply put, Africa is nearly 14 times the size of Greenland. Russia, which appears very large compared to the rest of the world is actually 6.602 million square miles–a little more than half the size of Africa. Compare Brazil with the contiguous 48 United States of America. The 48 states have an area of about 3.1 million square miles. Brazil has an area of about 3.3 million square miles, but the United States looks bigger than Brazil on this projection. You would also never be able to tell that Brazil is only slightly smaller than Canada which has an area of about 3.8 million square miles because Canada’s size has been exaggerated. Quite clearly, the way the map portrays less affluent parts of the world is not accurate by any means. And arguments against this projection claim that the map promotes regions that are predominantly white. However, the map was not designed in a racist manner. The mercator projection was drawn in 1529 by Gerardus Mercator to help sailors navigate long journeys. Other cartographers in this period designed maps using elliptical projections which sailors and explorers would have to recalculate on long journeys. On the other hand, the Mercator projection preserves straight lines of longitude and latitude that meet at 90 degree angles. But every map has its drawbacks and the Mercator is no exception. In order to preserve these straight lines that are useful for navigation, the regions near the North and South poles are stretched accordingly which explains why Greenland appears to be the same size as the African continent. If this concept is hard to grasp, use this scenario that is used to explain the distortion. Imagine a paper cylinder with a globe inside of it. Now, pretend the globe has a light inside of it so that the markings on the globe are shown on the paper cylinder that surrounds it. The regions near the equator will be more accurate because they are directly touching the paper while the areas near the poles are expanded. So yes, predominantly white countries are made to look larger than they actually are, but the map was not designed for the accurate portrayal of land masses. This projection was and still is extremely useful for navigation purposes; however, it is questionable whether they should be used in our schools. Using the Mercator map projection to teach geography in our schools is almost dangerous. Geography teachers must constantly remind their students of the distortion of several regions. If not, this projection has the potential to promote ideas of white superiority and eurocentrism. Size often denotes importance, so when students use a map that dramatically decreases the size of Africa, it can change the way they view that region without them even knowing it. And even if students are constantly reminded of the size distortion, the problem will not go away entirely. The world is a sphere in outer space. Therefore, there is no definite top, bottom, or center. The top, bottom, and center of maps is entirely decided by the cartographer. Why, then, do we rarely see maps with Asia in the center? Why were countries and regions like the United States and Europe placed in the Northern Hemisphere while Africa and South America are in the Southern Hemisphere. This designates Africa and South America as second-tier regions when, in reality, the Earth can be viewed from any angle. This map shows a vertically flipped Earth, as opposed to the one we are used to. This map is also vertically flipped; however, instead of Europe being at the center, Australia is placed in the middle of the map. This map also shows the world with Australia at the center. The way in which we view the world has a profound impact on how we treat people who are different from ourselves. When we use one map that only shows one depiction of the Earth, we miss all other perspectives that should be valued. No, maps are not inherently racist, we have just chosen a map with a single perspective of the world.